36 vintage Valentine's Day Postcards. 36 vintage Valentine's Day Postcards. Postcards are a wonderful way for us to share our treasure trove of images. Our postcard books on Easter, Halloween and Christmas have proven to be very popular, and so we turn to one of our favorite holidays--Valentine's Day. The valentine, as a graphic token to be exchanged by lovers on February 14, became very popular in the middle of the 19th century, and continued to increase in popularity and variety as the century advanced. In the first years of the 20th century there was an explosion in popularity of the picture postcard, and it was natural that postcards would be created to send on every holiday. 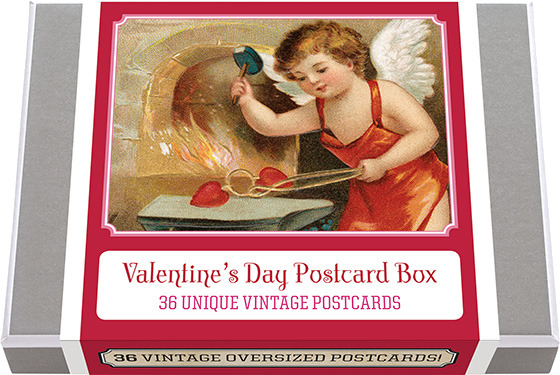 Tens of thousands of valentine designs were printed as Valentines. We have selected for this collection 36 unique images and added a vintage postcard back with dividing line and stamp box. Made in America with high quality paper and packaged in a deluxe, keepsake box.